What a neat item for that Ancient Worlds lover. 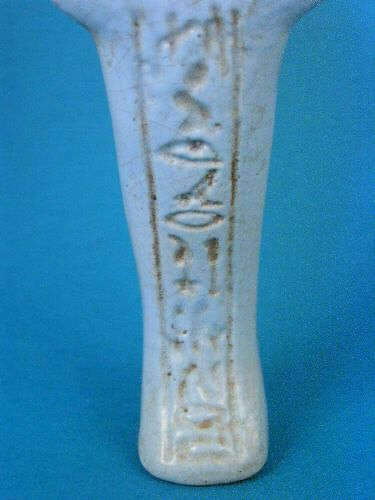 This is a wonderful Ancient Egyptian Ushabti with an excellent museum quality appearance. This piece is much more pretty than photo's reveal. This marvelous piece is made from faience with a Glazed baby blue color. Hieroglyphics can be read down the front of the piece. This ushabti wears a tripartite wig and holds his tools for working the fields in the afterlife. You will not find another one like this so bid accordingly.Please examine all photos provided. This piece is a real beauty! Appears to be of late period or Ptolemaic Dating. 5" by 1.5" inches.